Veteran consumers of fast food have certain expectations—certain low expectations. At the start of every month, we expect fast-food chains to introduce new “limited time only” products, and by and large, we expect those products to re-combine ingredients that the restaurants already have on hand. We don’t expect that any new item will change our perception of fast food as cheap, inferior, and bad for our health—though we do appreciate the effort that the good people at the restaurants’ corporate offices put forth to foster the illusion of novelty. Few fast-food places have been more brazen about the monthly game of mix-and-match than Taco Bell, which apparently only has about half a dozen ingredients on hand at any given time, along with a chart hanging over the melter that keeps track of all the possible combinations. Every time Taco Bell introduces a new ingredient—be it bacon, spicy chicken, or a puffy flatbread—it’s only a matter of time before they run it through The TB Gauntlet, adding a version with nacho cheese, then a “fresco” version with all cheese replaced by a watery pico de gallo, then a version with an extra tortilla glued to the outside by a layer of refried beans, and so on. The Bell’s latest round of ingredient roulette has resulted in the Bacon Cheesy Potato Burrito, which elevates a heretofore-unheralded item on the Taco Bell menu—the actually-good Cheesy Fiesta Potatoes—to entrée status. 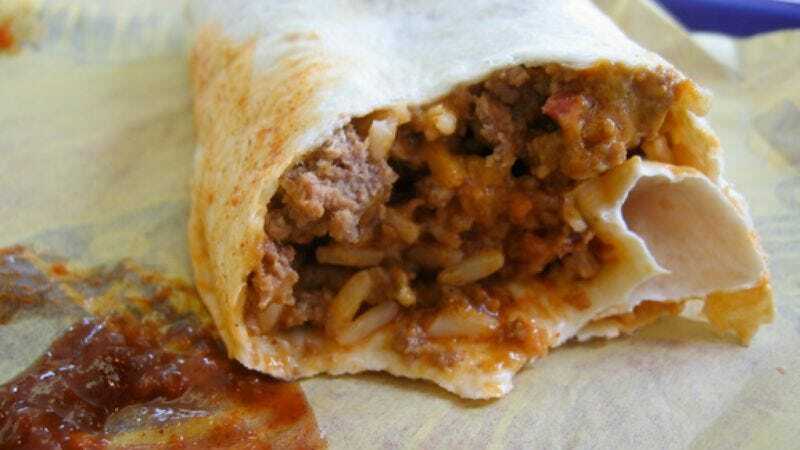 The burrito takes these little fried potato nuggets and tosses them in a tortilla with cheese sauce, bacon bits, seasoned ground beef, and sour cream. In the mouth, the texture of this beast feels like what an alien civilization would synthesize if asked to produce what we humans call “food.” In the esophagus and in the stomach—like most Taco Bell product—the Bacon Cheesy Potato Burrito feels like a Brillo Pad. Still, I admire Taco Bell’s willingness to keep experimenting with what’s sitting in the walk-in. The TB food scientists are like toddlers, mixing up the contents of their Gerber Graduates trays, or like me whenever I throw a few Ziploc Boxes worth of leftovers together with a fresh starch to make a “new” meal for my family. There’s something blessedly unpretentious about Taco Bell’s approach to new menu items. Come back next month, when they start tossing Cinnamon Twists into Meximelts. At least Taco Bell isn’t as presumptuous as Wendy’s, which is touting its new Sweet & Spicy Asian Chicken (along with the rest of its new line of boneless wings) as so “tasteful” that customers will think they’re eating in a fancy restaurant. This has become a common marketing approach for fast-food places over the past several years: pitching their products as practically fine-dining-worthy. Hardee’s/Carl’s Jr. has the confusingly named “Six-Dollar Burger,” which they market as being as good as the pricey need-a-big-knife-because-they’re-just-so-damn-huge burgers served at sit-down chains. Pizza Hut has aired commercials that show diners at fancy Italian places being fooled by the deliciousness of the Hut’s baked pasta dishes. And now Wendy’s—which already claims to be “way better than fast food”—has been running ads that insist the Sweet & Spicy Asian Chicken is the kind of dish you’d order if you were out at some place with cloth tablecloths and candelabras. What’s fascinating about Wendy’s latest endeavor—or fascinating to fast-food devotees, anyway—is that it represents the latest in Wendy’s string of attempts to foist lumps of breaded chicken onto consumers in different configurations. Wendy’s has served dipped chicken sandwiches and various kinds of chicken strips (sauced and unsauced), and the chain’s value menu currently features the dinkiest, blandest chicken nuggets in Christendom. And yet nothing Wendy’s has ever attempted in the rarefied realm of the poultry arts has ever topped the Spicy Chicken Sandwich, which is still arguably the most perfect entrée in the entire fast-food universe. Anyway, whenever I visited Herbie’s, the man himself was very cordial, probably because I never hollered at him. And those Herbie Balls were good: warm and crispy and sugary, perfect for soaking up the alcohol after last call. The main problem with Hardee’s Biscuit Holes is that they’re served at breakfast. Hardee’s should stay open 24 hours and only serve the Biscuit Holes between midnight and 4 a.m. But hey, what’s there to complain about here, really? The Biscuit Holes are fried dough dusted with cinnamon sugar and served with frosting. They’re delicious. In fast-food consumption as in fast-food packaging, some things shouldn’t be overthought.